The New York Times, August 6, 1937. Hitler's rejection from the Academy of Fine Arts Vienna as a young man has long been lamented as one of those tiny, isolated historical events that could have changed everything. "If only he had passed the drawing test." While he's largely been considered a poor, at best mediocre, artist, Guardian writer Peter Beech recently argued that his paintings aren't that bad. "In fact, they're quite sweet," he writes. After that failure there wasn't much art in Hitler's life until the mid-1930's, when he famously ordered Adolf Ziegler to confiscate "degenerate work" from around Germany. Particularly egregious examples were assembled in an exhibition that began in Munich in 1937 and eventually travelled around the nation. Meanwhile, the Chancellor demanded that the federal government attempt to collect all of his early paintings to ensure their preservation. 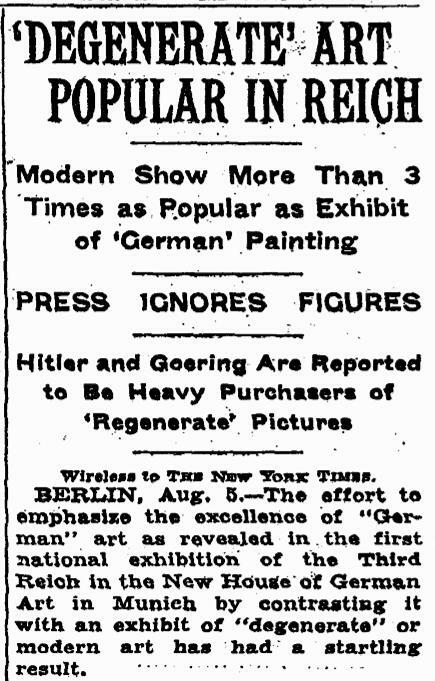 Though I'd never read about it (until stumbling across the article excerpted above), it turns out that Hitler curated a simultaneous show of "German" art (the Times uses quotation marks in their report, as well) at the New House of German Art in Munich. Unfortunately for him, the attendance at the "degenerate art" show far outpaced the turnout for his effort 396,000 to 120,000, a source of major embarrassment, according to the Times, which reported that "most newspapers suppress[ed]" the figures. Striking an ominous tone, the wireless report noted that the crowds at the "degenerate" show included "many German art students to whom this exhibit is presumably their last opportunity to study modern art..." Hitler (and Goering) eventually bought many works from the sparsely-attended show that Hitler assembled. "[T]he highest price - 15,000 marks - being paid for Constanca [sic] Gerhardinger's Peasant Family at Grace." Last week Michael Kimmelman questioned the power of art to alter everyday life, noting that "it won’t make sense of a senseless murder or help change the mind of a violent bigot." That frank admission provoked harsh rebukes from some corners. Former SFMOMA and Whitney director David Ross, for example, wrote on Twitter that Kimmelman's "lack of belief in art as an agent of social change has long been clear. Now its really clear. So sad." That seemed a little harsh. Art is not able to prevent violence or hardship or poverty. Nor can art instill morality, ethics, or a respect for the law. Have you felt like a better person after looking closely at a work out of art? We might look at art to feel good, but we never look at it to become good. However, Kimmelman argues that, while "the arts won’t save us, we should save them anyway. Because the enemies of civilized society are always just outside the door." Art represents a society's highest faith in itself. Its goodness is a necessary illusion. Hitler's vision for his society and its faith was disgusting and twisted, but he understood that game. Thankfully, the public, in deciding what to view and support, gets a major voice in deciding how that project concludes. In 1937 the German people and visitors to the country picked the "degenerate" work over Hitler's "regenerate" exhibition. The supposedly invincible Fascist had to buy in the works from the show he curated. Today, Gerhardinger, the top seller at the New House of German Art is lost to history, while many of the "degenerate" artists (among them Kandinsky, Klee, and Kirchner, just to name the most notable names beginning with K) are seminal, foundational figures in 20th century art. just found your site.. nice!